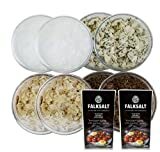 Mediterranean Falksalt Sea Salt, from Larnaca, Cyprus, is what is known as a “finishing salt.” Its large pyramid-shaped flakes have a delicate crunch that add texture as well as flavor to hors d’oeurves, seafood, meats, or side dishes. The all-natural flavors — that include rosemary, wild mushroom, chipotle, citron, wild garlic, Karl Johan Mushroom, black, red chili, as well as plain – have all-natural colors as well. A small dish of vivid yellow, black or red salt is a visual pleasure as well as a joy to the palate.